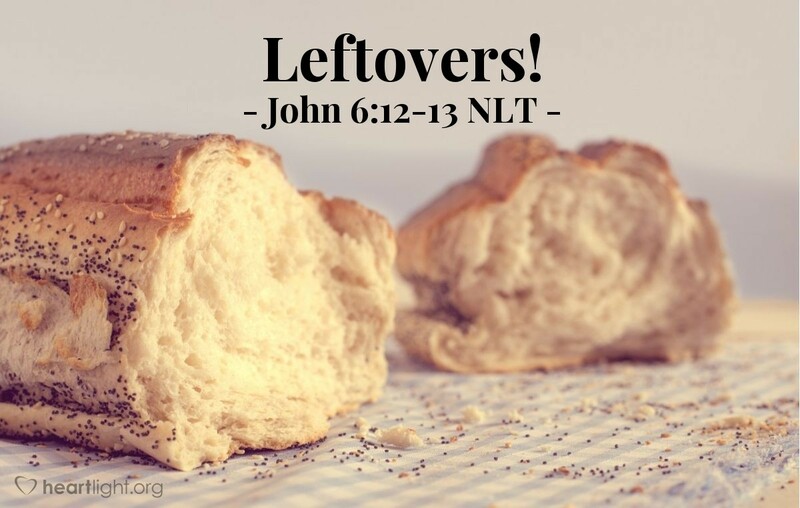 After everyone was full, Jesus told his disciples, "Now gather the leftovers, so that nothing is wasted." So they picked up the pieces and filled twelve baskets with scraps left by the people who had eaten from the five barley loaves. Some leftovers I love. Others I can do without. These leftovers are marvelous. I especially love the fact that there were 12 baskets of leftovers — one basket for each apostle! I really don't think Jesus' only concern was avoiding waste or not leaving a mess. No, I believe he really wanted to leave an indelible memory on his closest friends. Once Jesus returned to the Father, these men would be faced with impossible challenges. They would find themselves in situations they couldn't begin to handle on their own. This one memory would remind them again and again that the power was from Jesus, not from their strength or resources. They had picked up the scraps with their own hands. They had carried the baskets. They had seen the boy's picnic lunch that had fed the huge crowd. Those leftovers were the tangible grace of Jesus left for them to touch. Nothing could be a more powerful reminder that their meager resources, touched with prayer, could meet the needs of others and much, much more. Father, let me experience the leftovers of your mighty work after having stepped out in faith. I believe you can move mountains, heal diseases, and perform works that I can neither comprehend nor imagine. But, dear Father, I am always happy to pick up the leftovers from such events! Show me the leftovers. In Jesus' name, I pray. Amen.